Where do you find gardening ideas? In the quiet of winter, gardeners may take a physical break from backyard chores but still actively stretch their minds for new ideas. For me, I love pouring through garden magazines while my husband watches Sunday afternoon football. I also pull out my camera and head to horticulture trade shows, like the one in town last week. And, year round, I seek ideas from travel experiences, nature walks, garden tours and artists’ works. 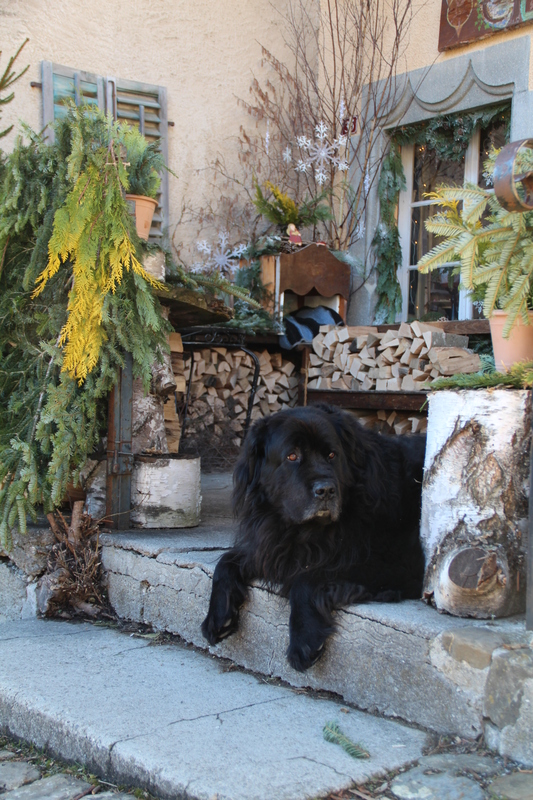 Over the holidays while visiting family in Switzerland, I was amazed with the wealth of winter décor ideas packed into the tiny mountain village of Gruyere. 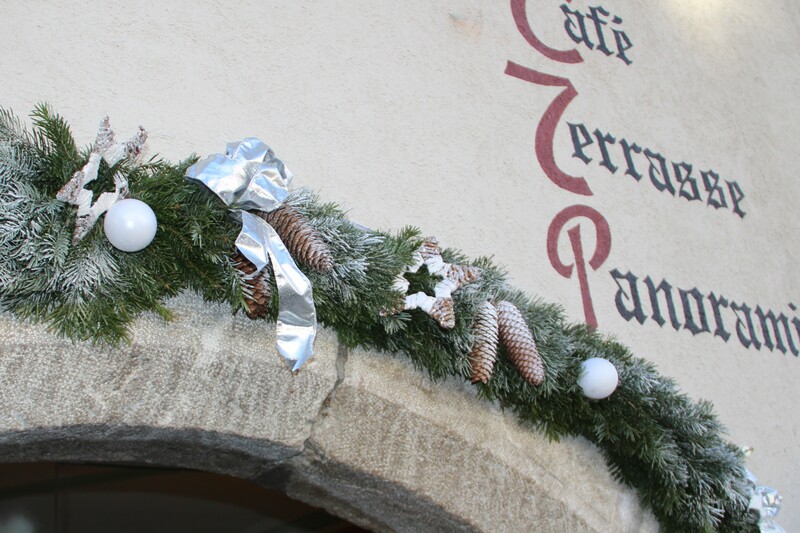 Here, residents charmingly decorated their windows, doors, stone stoops, front steps and door frames. We later realized the window numbers were tied to a decorating contest to further spur the town’s creativity. Here are a few favorite designs that have winter-long appeal. The new year is full of announcements of the various 2014 “picks”, likes and awards of plants, colors, animals and more. 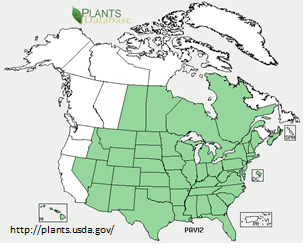 One announcement I eagerly await is the Perennial Plant of the Year, selected by the members of the Perennial Plant Association. This choice is based on what growers, sellers, designers and educators think is a good garden plant. 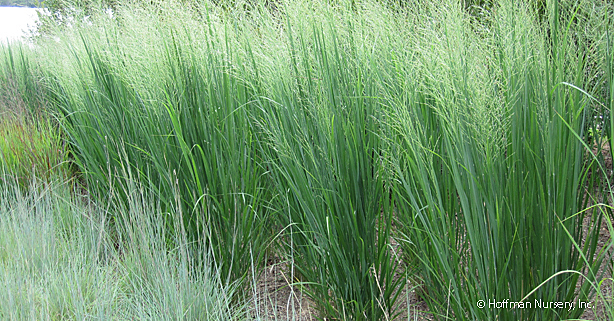 Northwind switchgrass, a child of plants that grew in a railroad easement in Illinois, is a good garden plant. The kudos go to Roy Diblik of Northwind Perennial Farm in Illinois who selected ‘Northwind’ from seed he collected in the early 1990’s. Our native switchgrass is beautiful. In the late summer you can still see it in open fields – and railway easements – with its arching habit and its soft pink to purple flowers that mature to golden seedheads. This is a plant that takes care of itself and is part of the native fabric of our prairies. Some of the earlier selections were not able to adjust to the good life of the perennial garden – lots of water, fertilizer and sometimes, not enough sun. They flopped. Northwind is different with its upright habit, golden flowers and olive toned leaves that are shaded with blue. It tolerates moist to dry soils, and grows best in full sun where it will show its colors. Korean feather reed grass (Calamagrostis cultivars) is often the first choice when a strong vertical line is desired in the garden. 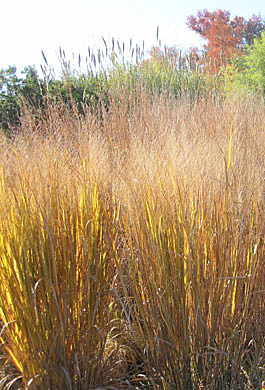 Northwind switchgrass is an alternative that also offers excellent fall color. And Northwind’s native pedigree will make it a good choice for gardeners who want to focus on using native plants and creating landscape habitats such as rain gardens, meadows and wildlife refuges. Photo Credits: Thanks to John Hoffman of Hoffman Nursery, Inc.
What are the trendy gardens growing in 2104? Want to be part of the gardening in-crowd in 2014? Plant tomatoes, beans or some other edible. If this sounds familiar, it is. Vegetables are expected to continue holding their own as must-haves this year. An estimated 54 percent of the 78 million U.S. gardening households grew vegetables in 2013, according to the most recent survey by the Garden Writers Association. This is the same percent as in 2012 but up a hair from the 53 percent in 2010 and 2011. The nonprofit, international association of garden communicators and industry representatives also reports lawn and garden spending was an average of $615 per household in 2013, up slightly from 2012. Since the financial crisis in 2008 and onset of the Great Recession, growing your own food grew in popularity, according to annual trend surveys by the association. Besides saving some money on the grocery budget, people grow their own food for safety, flavor and self-sufficiency. Still, overall spending estimates for lawns and gardens over the past three years has been relatively static: $600 in 2010, $530 in 2011 and $600 in 2012. The tallies include plants and maintenance and covers in-ground and container gardening. Lest we get too excited with such expenditures, the survey shows 66 percent of the respondents spent less than $500 on the yards and gardens in 2013. Forty-one percent of consumers estimate they spent most of their money on lawns and grass. Certainly that’s not a surprise for those of us in the Midwest, where spacious, well-groomed lawns are a source of pride for many. Vegetables and fruit plants were a close second at 39 percent. Other areas are: perennial flowers (29 percent) third, trees/shrubs (27 percent) fourth and annuals (26 percent) fifth.